Greetings. I would like for my students to submit multiple short recorded clips of themselves practicing a short script. In BB, I was able to set it up as a test and have them browse their PC and upload each recording. Is there a way for them to record themselves within Canvas as an assignment or will I need to create an assignment and select the media upload option? You can have students record in Canvas with anything that has the Rich Content Editor. This guides explains the process: How do I record audio using the Rich Content Editor? So you could set this up as either an online assignment with "Text Entry" selected (How do I create an online assignment? ), a quiz with an essay question (How do I create an Essay quiz question? ) or even a discussion board (if you wanted the students to share their audio with one another). That is perfect and just what I am looking for. May I ask another question? Can I create one assignment and then add it to different modules or days or do I have to create a new one for each day? My students have a daily 'voice board' they have to submit. You could reuse the same assignment, but the drawback is the students will lose access to previously submitted work. An instructor can view previous submission to an assignment, but students can't, so reusing an assignment isn't ideal. There is an idea about this: Student view: View submissions and comments for all submissions.Canvas has responded to this idea, but has not yet given a timeline as to when it will be implemented. In order to avoid having to create dozens of assignments, or having students lose access to their previous work, you can create a 'private' discussion board for each student to post their work everyday. This will allow students to post daily, in the same place and still be able to access their older submissions. In order to achieve this, you must first create a new "Group Set." This guide explains how to do this: How do I add a group set in a course? When creating the group set, you will want to use the "Split students into X equal groups" (number 3 in image below) and enter the amount of students in the class. This will create a separate group for each student. You then will want to create a group discussion for this group set. This is explained in this guide: How do I create a group discussion in a course? There are a few caveats to using groups, such as each group having it's own "page" that is separate from the course, so students will need to navigate back to the course page. You will also have to explain to your students that they are the only members of the group, so other students will have not access to the discussion board. 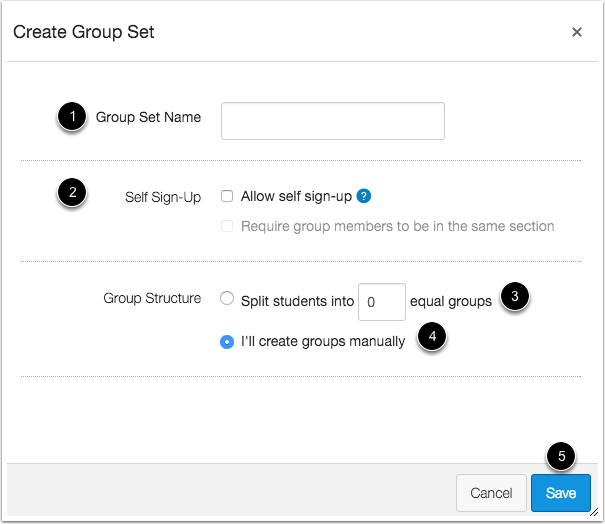 Also, if a new student joins the course after you created the group set, you will have to manually create a new group for them within the group set. Feel free to ask any question if I did not explain this clearly.